Socha Management is proud to announce that two new companies are now calling Socha Plaza home! Zinful Thoughts Wine & Liquor, the area’s finest wine and liquor center, is now open at Socha Plaza 123. The store, which is operated by founder Carrier Peek, offers an outstanding selection of wine and liquor products from regions all over the world. Zinful Thoughts is open seven days a week, from 9 a.m. to 9 p.m. Monday through Saturday and 12 p.m. to 5 p.m. on Sunday. Learn more about Zinful Thoughts here. Over at Socha Plaza 115, those looking for some investment advice can now get it from Edward Jones! One of the nation’s leading financial advising companies, Edward Jones offers a range of financial strategies to help you identify opportunities and build wealth. It also offers one-on-one advice and outstanding customer service to ensure every client gets the attention he or she deserves. So, if you’re in search of some new investment vehicles, stop on over to the first floor of Socha Plaza 115 next to Albany Med EmUrgentCare and say hello! And when you’re done, take a short walk over to Socha Plaza 123 and find yourself a nice bottle of wine at Zinful Thoughts Wine & Liquor. You’ll be happy you did! 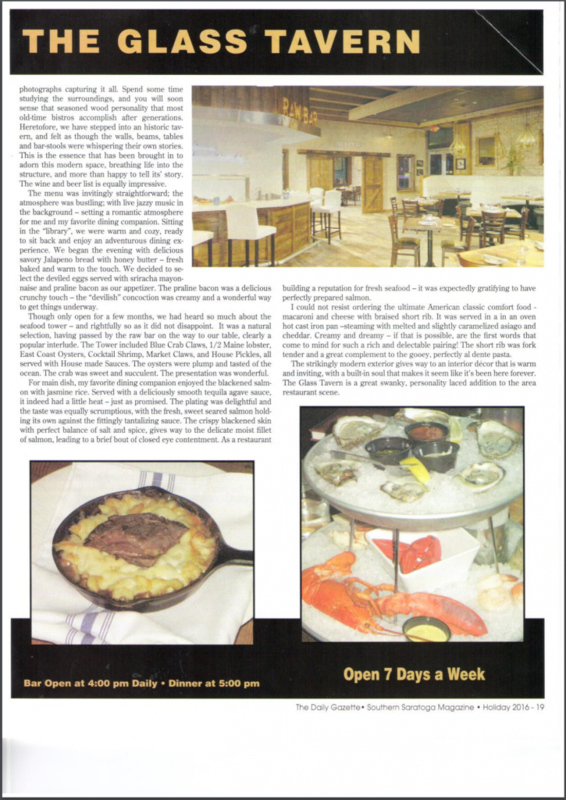 The Glass Tavern, co-owned by Bill Socha, has received another fantastic review from the Southern Saratoga Magazine on its cuisine and ambience. In the review, The Glass Tavern was said to be “a great swanky, personality laced addition to the areas restaurant scene”. The review was the latest in a long line of glowing endorsements from local food critics and patrons who have been impressed with The Glass Tavern’s exquisite food and ambiance. Contributing writer Nigar Hale of the Southern Saratoga Magazine writes, “We were seated in the Fireplace room, known as the Library, with bookcases going up to the ceiling on the evening of their grand opening celebration. One of many intriguing elements of this restaurant experience includes the slate roof tiles that make up the bar surface,”. “The artisanship alone is worth the trip”. To continue reading the review, please see the images below. Socha Management is proud to be the host for two new tenants, The Center for Rheumatology, and The Glass Tavern Restaurant. The Center for Rheumatology will be taking over a space on the second floor of Socha Plaza 115, joining other healthcare providers, including Albany Med EmUrgentCare, Ellis Primary Care, and Sunnyview Rehabilitation Center. The Glass Tavern Restaurant will be on the first floor next to Brittany Jewelers and Krause’s Homemade Candy. Our team at Socha Management was pleased that the Albany Business Review featured an article offering insight into what the new tenants have to offer. 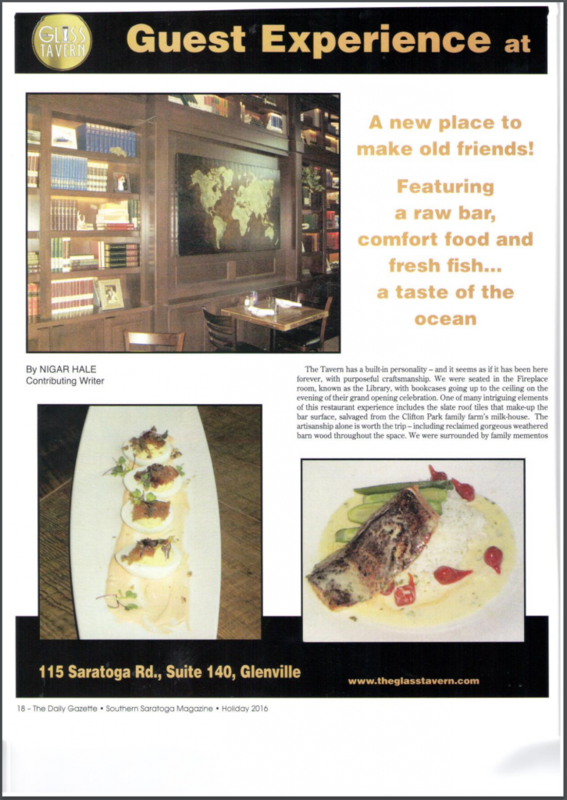 We wanted to thank the Albany Business Review for its support and excellent piece about our two new additions. Socha Plaza 115 is open to a variety of businesses, and its multi-use spaces meet the needs of every tenant. Socha Management welcomes its two newest Socha Plaza 115 tenants, The Center for Rheumatology, which took over a space on the second floor of Socha Plaza 115, and The Glass Tavern Restaurant, residing on the first floor. The Socha Management team was thrilled that the Times Union published two pieces about its new tenants. Socha Plaza 115 is home to a variety of tenants, and we’re pleased to welcome our two newest: The Center for Rheumatology and The Glass Tavern Restaurant. At Socha Plaza 115, we’re honored to house so many different businesses, including retailers, like Krause’s Homemade Candy and Brittany Jewelers, as well as medical providers from Albany Med and Ellis Primary Care. Adding The Center for Rheumatology and The Glass Tavern Restaurant is a delight! In case you missed it, The Daily Gazette showed interest in our growth by featuring the new The Glass Tavern Restaurant in a lengthy article. We wanted to thank The Daily Gazette for writing a story about our building, and look forward to the restaurant’s grand opening in mid-July. It is with a heavy heart that we announce the passing of our founder, mother, grandmother, and esteemed businesswoman, Sophia K. Socha. We will miss her dearly. Sophia Katherine Socha (Sophie), age 86, of Glenville, NY, and beloved widow of Walter J. Socha, entered into eternal rest with her family by her side on Wednesday, May 11, 2016 at Wesley Health Care Center in Saratoga Springs. Born, Sophia Katherine Kopacki, on January 1, 1930 in Schaghticoke, NY, she was the daughter of Andrew Kopacki and Apolonia Filipek Kopacki. She grew up in Clifton Park, NY on her family’s Waite Road farm and attended school at a nearby one-room schoolhouse. She later graduated from Burnt Hills – Ballston Lake High School. After graduating from high school, the intelligent, numbers-savvy Sophie went to work for General Electric, working in the Payroll Department. Beautiful, as well as smart, Sophie did some informal modeling for a local clothes shop. An exercise enthusiast, Sophie even spent a few years as the gym teacher at St. Helen’s Catholic School! Her major life’s work began after meeting, Walter J. Socha, a home builder. After they married on July 15, 1951, Walt relied on Sophie to meet with their home buyers and manage the contracts for their home sales. Together they created Walter J. Socha Builders, and after building and selling several homes and neighborhoods, they turned to apartment building and property management of those properties. Sophie filled the roles of rental agent, human resources, office manager, bookkeeper, as well as customer service, and later managed the office staff that was needed as the business grew. Sophie had many interests outside of work. She loved gardening, and her yard was always Better Homes and Garden worthy. Red, pink and white geraniums and pink-purple hanging fushias were her favorites. She traveled the world with her husband, Walt, often with local Home Builders Association members. Sophie and Walt shared a love for the game of golf and were longtime members of The Edison Club, where they had many friends. Sophie loved fashion and looking her best, but was equally comfortable in casual clothes, enjoying the company of her grandchildren. She also loved polka dancing and was a devout Catholic with a special love for the Blessed Mother Mary. Sophie is survived by her three children, Michael J. (Sara Landon) Socha, Marilyn Socha-Ruggiero (Lou Ruggiero) and William J. (Shelly) Socha; as well as her sisters, Caroline Trzeciak (Joseph), Julia Lipinski; and brother, Florian (Janet) Kopacki. Additionally, Sophie is survived by her six grandchildren, Natasha Wyatt, Brandon Wyatt, Zöe Socha, Grace Socha Sanders (Joseph Sanders), Grant (Erin) Socha and Taylor Socha; as well as several nieces and nephews. Sophie was predeceased by sisters, Frances Mutryn and Mary Chotkowski; and brothers, Stanley, Fred, Frank and John Kopacki. The family would like to extend heartfelt thanks to the amazing and loving staff of 3 Hathorn at Wesley Health Care Center. These caring professionals became Sophie’s extended family. In lieu of flowers, the family requests contributions be made in Sophie’s memory to Wesley Health Care Center, The Wesley Foundation at www.thewesleycommunity.org (or 131 Lawrence Street, Saratoga Springs, NY 12866) and/or The Church of The Immaculate Conception, 400 Saratoga Road, Glenville, NY 12302. SCHENECTADY COUNTY, N.Y. — An innovative restaurateur and a management and development executive from Glenville, N.Y. are pleased to announce a partnership aimed at providing a new dining “experience” tailored to the discerning tastes of Schenectady County and its unique communities. Christopher R. Evans, a seasoned restaurateur with roots in South West Florida, have completed the design and is currently constructing The Glass Tavern, located along the Route 50 corridor in Scotia-Glenville. The 5,200 square feet of Socha Plaza 115, is a spectacular glass and brick mixed-use landmark recently opened by William J. Socha. Evans said he and Mr. Socha have designed The Glass Tavern as a unique setting for hometown hospitality and great dining, offering a variety of atmospheres – a formula he has already tested and proven at The Turtle Club & Claw Bar , a successful coastal tavern seafood restaurant along Florida’s famed Gulf Coast. “The variety of Glass Tavern’s dining experience is unified by our ‘house brand’ of hometown hospitality, which shapes every dining experience whether the meal and beverages are shared with business associates, friends, or family as a spur-of-the-moment gathering or a planned occasion,” he said. The Glass Tavern at Socha Plaza 115 is forging its unique plan and design to complement the demands and opportunities presented by its position in the heart of a mix-use building in a rapidly expanding community, said William J. Socha. “As an integral part of Socha Plaza 115’s tenant mix, which includes residential, commercial, corporate residential, medical, and high-end retailers, The Glass Tavern is poised to become a community favorite both locally and as a dining destination,” Socha said. “I am delighted to welcome Chris to our team and look forward to his contributions in our community,” he said. The Glass Tavern is conveniently located on Route 50, across from Schenectady County Airport in the landmark Socha Plaza 115 building. The restaurant is slated to open this summer. Socha Management, Inc. was honored at the Capital Region Chamber of Commerce’s Annual Awards Dinner with the “Enterprise of the Year” award. Socha Management President William J. Socha proudly accepted the award on behalf of the company, his family, and his parents, who were instrumental in making the “Socha” brand a time-honored company in the Capital Region. Please see below for a video produced on behalf of the Capital Region Chamber of Commerce about Socha Management and why it was chosen as the 2015 Enterprise of the Year. Socha Management would again like to thank the Chamber, as well as the nominating committee, for choosing Socha Management for this prestigious award. Socha small preview from at PROCTORS on Vimeo. Socha Management, Inc. is proud to announce that its new mixed-use building, Socha Plaza 115 is officially fully-rented. The leasing of all of the luxury and standard apartments is indicative of the popularity of Socha Plaza 115. The building’s corporate apartments and commercial spaces are also in high demand, with only a few units still available for lease. This is good news not only for Socha Management, Inc., but the entire local community, as it proves that there is a strong desire within the broader community to live and work in Glenville. Socha Plaza: THE Destination of Health Care? On February 20th, the Albany Business Review published an article that begs the question: Is Socha Plaza’s Mixed-Use Building becoming the place for local health care facilities?